I have said in a previous blog how much I love animation. While I don't see every animated movie that comes out, I do see a lot of them. 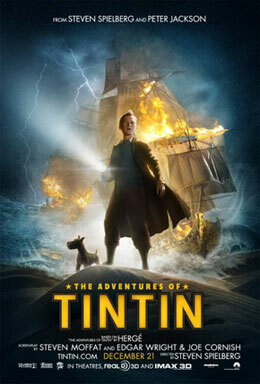 Last night it was the Adventures of Tintin. First - a little history courtesy of Wikipedia. I have not checked all these facts so keep that in mind. "The Adventures of Tintin is a series of comic books created by Belgian artist Georges Remi (1907–1983), who wrote under the pen name of Hergé. The series is one of the most popular European comics of the 20th century, with translations published in more than 50 languages and more than 200 million copies of the books sold to date. The series first appeared in French in Le Petit Vingtième, a children's supplement to the Belgian newspaper Le XXe Siècle on 10 January 1929." The 2011 Hollywood 3D version was directed by Steven Spielberg, who acquired the film rights to the series in 1983 at Herge's death. Originally it was to be co-produced by Universal and Paramount, but when Universal opted out, Sony stepped in. Also involved in the project were producer Peter Jackson (whose company Weta Digital provided the computer animation) and writers Steven Moffatt, Edgar Wright and Joe Cornish. Now enough of the dry background and onto my review. I loved it - there it's been said. For me, it was humorous and captivating in all the right ways. The movie obviously tickled the fancy of the few kids at this later showing and the adults all had smiles on their faces as well. It is definitely a period piece set in a time when there were 3-masted ships driven by the wind. Tintin is a journalist with a history of solving crimes who lives in a European town and is always accompanied by his brave and resourceful dog Snowy. There is a bumbling pair of almost identical detectives that constantly circle in and out of his world. Good and evil battle it out with good, of course, triumphing. I want to stay away from the plot in case you haven't seen it yet, so I'm just going to share what stood out for me. The animation hit me first. It was a very different style from what I usually see and so realistic I was floored for the first few minutes while trying to process the fact it was all fantasy. A lot of today's animation has incredible detail - like Rapunzel's hair in Tangled - but this animation was eerily real. They actually had to make the figures look more cartoonish - bigger noses, longer faces, extra round faces, etc. Adding 3D to the picture took the whole effect to the next level. I have heard people complain that sometimes 3D is just a selling point and not really taken advantage of in a movie. Not so here - it was used to great effect. Another stand-out feature for me is, I suspect, due to Spielberg's influence. All through the movie I kept noticing the great angles the movie was "shot" from - only to have to keep reminding myself it wasn't shot. It was if Spielberg was given a cartoon camera free of the restrictions physics applies on a regular movie and used it to it's ultimate limits. We had aerial views, ground up views, the effect of a camera following someone in a crowd and more. Avatar had some unusual perspectives, but not to this level. This was hands down cutting edge and I can only suspect his experience in film provided the impetus. I would have love to have been a fly on the wall when animators were given the challenge to create this effect. I can't tell you how many times while caught up in the plot I kept catching myself in the lie; having to remind myself there was no camera or cameraman - just a team of people working on a computer. Yes - this is animation!! The last I want to comment on here was the chase scene. Sorry James Bond - the trophy has passed. Gone are the laws of physics as a historical car, a motorcycle with side car, an assortment of people both good and bad, Snowy the dog and a crow careen through the fictional Moroccan city of Bagghar trying to keep control of 3 scraps of paper. Those scraps change hands (or claws or jaws) constantly as the characters create havoc and survive death-defying feats not possible in real life. It was the chase scene of all chase scenes and worth the price of the ticket alone if you're a fan of the genre. There is a lot more I could share, but the movie really should be seen before you know too much. I was lucky to read and hear absolutely nothing before I went, so the impact of the movie was not influenced by others. If you have been considering whether to go, I recommend getting out there while it is still available in 3D. It really does make a difference because of the style of the animation. The story will still be good on your home TV, but a lot will be lost in terms of being drawn in.